Mike Conway and the TOYOTA #7 TS050 HYBRID secured their first win of the season at Fuji, after a sensational race saw the team surge through the field after starting the race from 8th position on the grid in the fourth round of the 2018-19 FIA World Endurance Championship. Friday’s first free practice got underway in Fuji in damp conditions, but despite this, it was yet another productive day for Mike and the #7 Team, where the pace was set throughout by both TOYOTA teams. 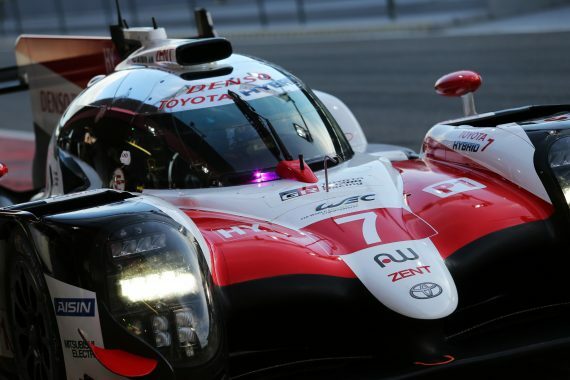 In a session which was disrupted by a red flag due to damage to the trackside kerbs, Mike Conway, Kamui Kobayashi and José María López, set the second quickest time of first practice, only 1.095-seconds behind their teammates in the #8 TS050 HYBRID. Second practice was dry throughout but followed a similar pattern to the first session, with a 40-minute red flag period prompting a 10-minute extension of the session, allowing Mike to run through various mechanical, aerodynamic and hybrid settings before an important qualifying session and ultimately the race on Sunday. A dramatic qualifying session in Fuji saw Mike and the rest of his team end up in 8th on the starting grid despite initially earning pole position; however the #7 TS050 HYBRID was stripped of that honour, and the World Championship point it brings, due to a pit lane speeding violation. As Mike’s teammate José María López came into the pits following his flying lap, he did not correctly engage the speed limiter before the pit lane entrance meaning he entered the pit lane 8.7km/h too quickly, causing his lap to be cancelled 90 minutes after the session. An action-packed start on a wet track saw the #8 car in pole position hold the advantage whilst Mike’s teammate, Kamui put on an overtaking show in the #7, exploiting the advantage of four-wheel drive in the difficult conditions to move from eighth on the grid to second by lap two. Changing weather added to the ever-present drama, with bright sunshine drying the track towards the end of the safety car period. That left the #7 car on inappropriate tyres for the conditions so the team were the first car to pit for slick tyres after the 30-minute interruption and they took advantage by immediately setting very quick lap times. The #8 took over the lead when Kamui brought his epic two-and-a-half-hour stint to an end, with Mike taking the wheel for the #7 car in second place, where he began another impressive stint. Momentum constantly swung between the two leading cars, depending on who had the newer tyres, and Mike was able to keep up with the #8 car in 1st place and put the #7 in a commanding position on strategy and after a full course yellow with two hours remaining, José in the #7 led by around 20 seconds from the #8. José kept a stable gap at the front until handing the lead to Kamui with just over 30 minutes remaining and Kamui had the honour of taking the chequered flag in the #7 for their first win of the season. This ended Mike’s two-year winless drought as he secured a triumphant victory in Fuji. This entry was posted	on Tuesday, October 16th, 2018 at 8:58 am	and is filed under Motor Racing. You can follow any responses to this entry through the RSS 2.0 feed. Both comments and pings are currently closed.